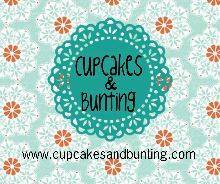 Hello dear friends & readers & a warm Welcome to my new followers . 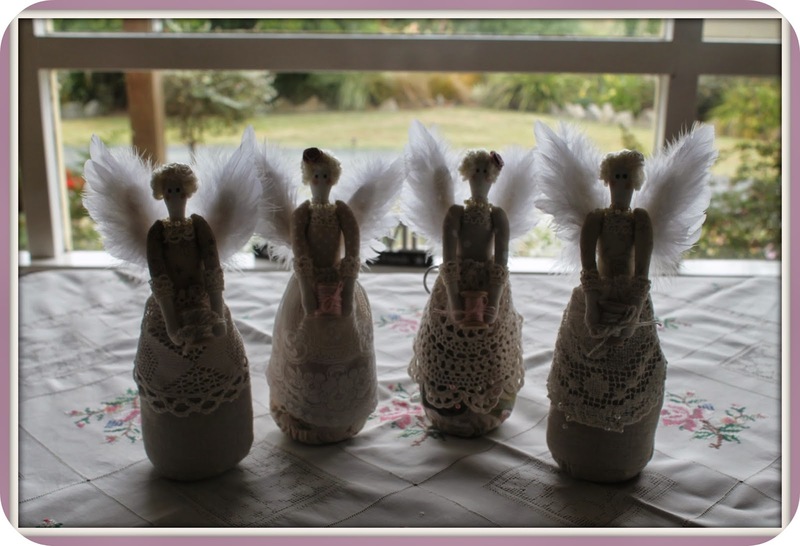 . .
Four little angels flew out of my sewing room this past week. 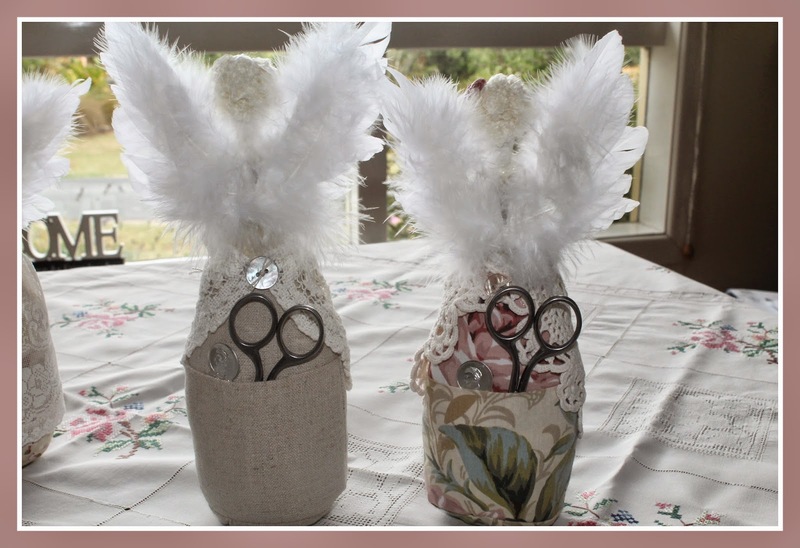 I popped a pair of small scissors & a needle threader in the back before gift wrapping them. The other two are now for stock for my little Cottage. 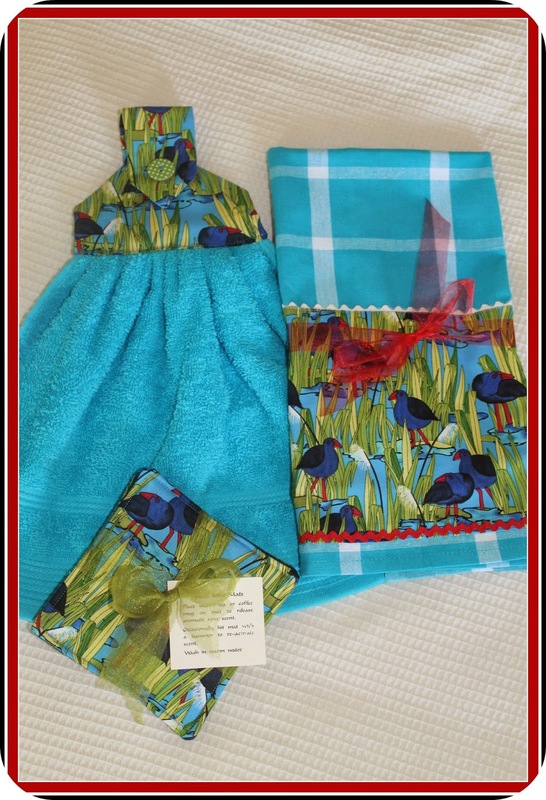 As she has bought the handtowels from me in the past, I decided to make another using my gorgeous bright Pukeko fabric. A set of clove scented spice mats to match & a teatowel trimmed in this seemed the perfect package. She was delighted with the gifts I had put together & took all 3 items. My hanging baskets are beautiful again this year but soak up the water like a bottomless pit . . .
. . . & fill the old suitcase on my deck with another small punnet. When the rustic chairs in my garden become rotten unsafe to sit on, I like to move them into the gardens themselves as I feel they can still look attractive. You have to be careful though, as customers will sometimes still go & attempt to sit on them ... so I have found if I place a pot of something on the seats, it discourages this from happening. Last week after finishing the millet silage, the Mr decided we should drive to Raglan for a dinner of fish & chips on the beach. Raglan is just over an hour from here & it our nearest beach. I love visiting Raglan & often wonder whether I would be happy to live there?? Yes I know ... I am pathetic the way I cart my tomato sauce all the way over to the beach !!!! At another Bay closer to the township, there were some kite surfers out having fun . . . It was such a nice outing & to get away to the seaside, even if just for a few hours. Lean closely into the screen & take a big sniff !!!! Thank you all so much for your visit today & all the lovely comments you leave me ... I appreciate them all so very, very much. Your first photo of the pincushions reminded me of the ladies from Downton Abby. They will make great gifts. Lovely photo's of your garden. New Zealand is still so green even in Summer.Sauce on fresh fish!!! I will say no more. 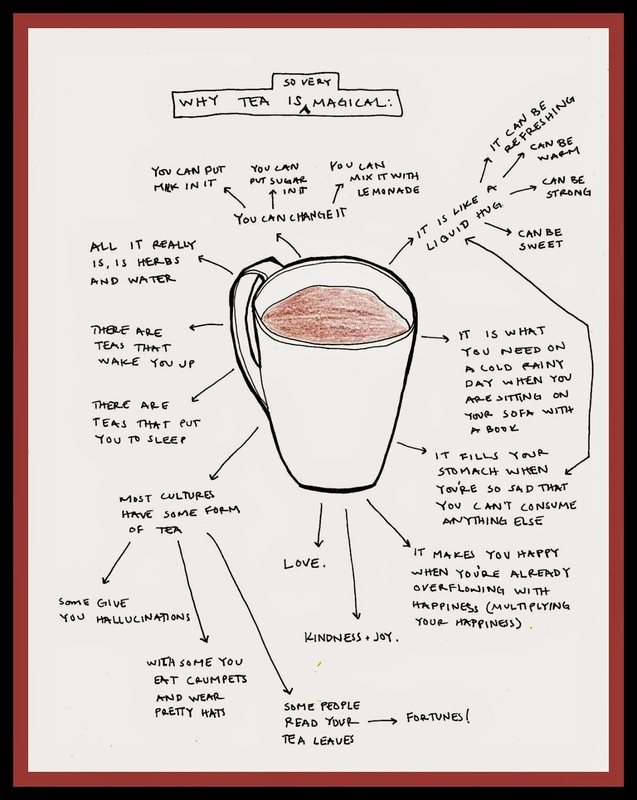 Enjoy your liquid hug. Those angels are so pretty. Your potted pots are singing the brightest of songs aren't they....they are all gorgeous en masse! I can almost the fragrance of your lavender all the way over here. One of life's best things is to eat fish n chips by the seaside...there is nothing quite like it. I am off to have a magical cup of tea in a very pretty tea cup! Hi Julie, a true kiwi always has her Watties on hand!. Raglan looks lovely, I've never been there. Your garden and home looks beautiful, so colourful and cheerful. I normally always use petunias in my pots too but this year I used white geraniums and am thrilled with them. I put hanging white geraniums in our baskets too. Really nice for a change. Those little angels are beautiful. Well done. 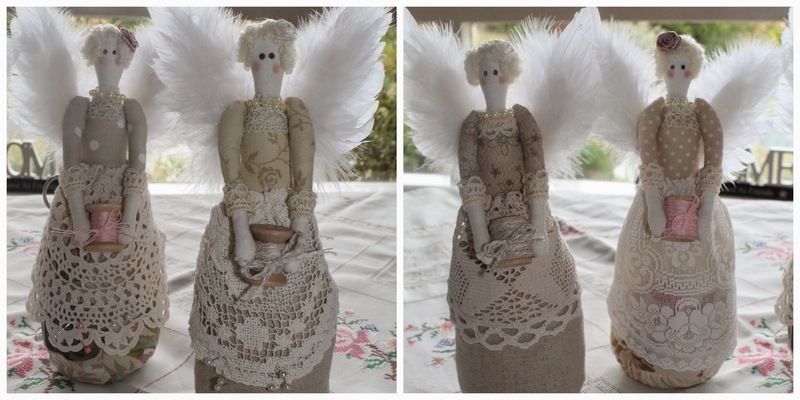 Your lovely pincushion angels are a great gift, I know as I have one and I just love it. Your garden is looking very colourful. You sure are doing well with all this hot, dry weather. The angels are gorgeous! And the garden looks FAB! So glad you were able to getaway. It looks so peaceful and lovely, but the water is always so calming that way. I am jealous of the tomato sauce carrier you have. I just saw these for the first time in the Paddington Movie and thought, well how cute is that!! Funny how I was just thinking of you and your lavender this morning. I am wanting to massage lavender oils on little B to relax him in the evenings. I am just off to the store to get some. Well Julie have a lovely rest of your Summer soon it will be that cool crisp air coming your way and all those beautiful flowers to water will be missed. Wow, haven't been to Raglan in more than 20years-still looks as beautiful as ever! Those angels look gorgeous! And the garden just as gorgeous! We are hoping for rain here in the naki, looks like you need it too!! Your garden is looking so colourful and lovely, especially your hanging baskets. I had one, only one and it passed away last week. I should have been doing what Julie does!! Those Angels are gorgeous, you clever girl you. Good old Raglan, takes some beating doesn't it? I would take my sauce, and a thermos so I can have a cuppa to wash away the fat, well when I say wash away, I mean wash it down!! Yes I don't think that I could stick them either Lol! Gorgeous! 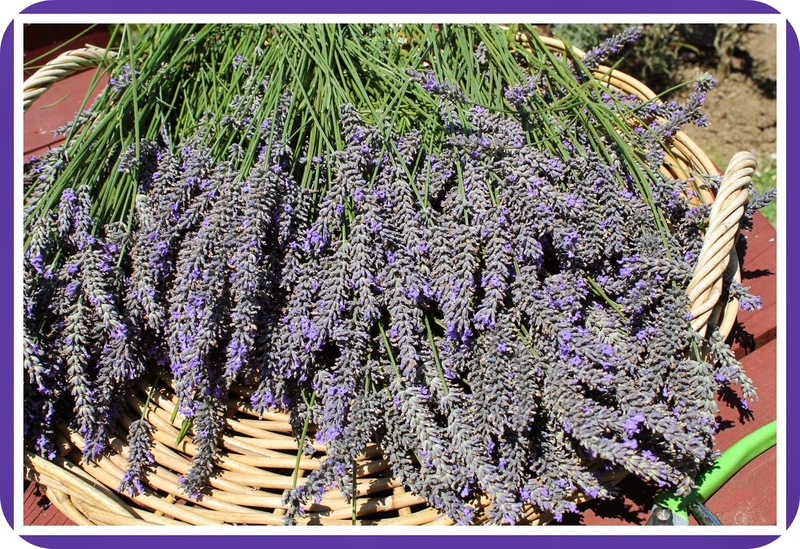 Your garden is a treat..love lavender. Nothing tastes as good as fish and trips at the sea. The pin cushions are delightful!, We have those long dry summers too and I find petunias can really take the heat, but when we do get some rain the flowers turn to mush! But they perk up again in a few days. I am growing geraniums this year for a change. Thanks for the memory trip to Raglan haven't been there for many many years..Not since I was a student at Waikato! Love the Tea verse!